Fee-only financial planners are registered investment advisors with a fiduciary responsibility to act in their clients’ best interest. They do not accept any fees or compensation based on product sales. Fee-only advisors have fewer inherent conflicts of interest, and they generally provide more comprehensive advice. The National Association of Personal Financial Advisors (NAPFA) is the leading professional association of fee-only financial advisors. NAPFA is distinguished both by the competence of its advisors and their method of compensation. Commission-based agents and brokers often take offense at this distinction. Blurring the difference, they created the category dubbed “fee based,” which means they charge a fee in addition to collecting commissions. Study after study show that even consumers seeking a strictly fee-only advisor find these terms confusing. Part of the annual fiduciary oath NAPFA members sign reads, “The advisor does not receive a fee or other compensation from another party based on the referral of a client or the client’s business.” Fee-only advisors help reduce the conflicts of interest inherent in how they get paid and what they recommend. My parents started their financial planning firm in the early days of NAPFA. They were attracted to the ideal of sitting on the client’s side of the table and acting in their best interests. I appreciate NAPFA’s model because it more easily allows my head and heart and my words and actions to align. It would be too difficult to run a business if its success pulled us in a different direction than working for our clients. Because we are getting paid to do whatever our clients would do if they had our time and expertise, we are free to do just that without as much concern about how we get paid for the service. 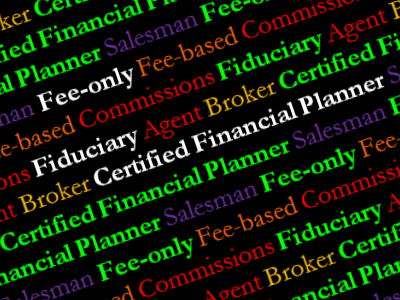 The fees of commission-based agents and brokers are tied to specific products and transactions. This model misses completely much of what clients need. Although even commission-based agents can serve their clients in unique ways, product commissions seem a backhanded way to acquire comprehensive wealth management. We structure our primary fee structure around managing all of a client’s financial affairs. Many of the services we perform for clients depend on an integrated plan that goes beyond investments. Trying to answer one issue in isolation can be difficult. Our services strive to be more holistic. We primarily charge a percentage of assets under management because of our emphasis on offering comprehensive wealth management. But fee-only financial planning includes other methods of charging clients such as a flat retainer, an hourly rate or a charge specific to the task at hand. For managed clients, we purposely don’t add any hourly rate. We do not want clients to hesitate to contact us. If there is an hourly charge many clients won’t call even when they should. Another advantage of a fee-only financial planner is that there are no financial hooks, surrender charges or lockup periods. Clients are free to leave at any time if they are disappointed. NAPFA members are often annoyingly fanatical proponents of the fee-only model. I’m no exception. I would rather see consumers handling their finances on their own than wondering if the products they have been sold are really the best option to meet their goals. And this is partly why we recommend competing NAPFA firms when our services are not the best match for a prospective client. It is also why we give away as much do-it-yourself information as we can. We want consumers to be as informed as possible about good wealth management techniques. Visit the National Association of Personal Financial Advisors (www.napfa.org) to find a fee-only advisor in your area. SEC Q&A: What should I do if the financial professional claims that he or she is “certified”? SEC Q&A: What is the difference between an investment adviser and a financial planner?